The ewer is in a gourd form with a curved tapering spout and a handle in the shape of a 'chi' dragon. 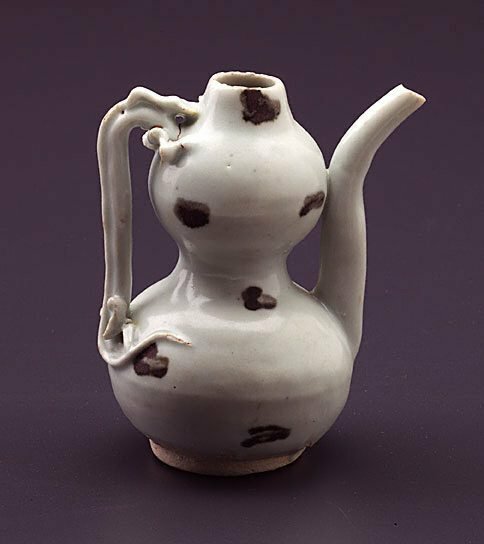 It is decorated with splashed brown iron spots, and covered with a 'qingbai' bluish-toned glaze. The advent of the Mongol Yuan dynasty saw no marked disruption to Southern Song traditions but did see the introduction of new decorative techniques both applied and painted. Moulded and modelled applique were used, with beading and studding as the two principal techniques. The elaboration of handle loops into serpentine 'chi' dragons was a distinctive achievement of the Yuan potters, adding an exuberant and fanciful dimension to the otherwise restrained Song ceramic forms. The Asian Collections Art Gallery of New South Wales , 'Export Ceramics', Sydney, 2003, 135 (colour illus. ).